“How did you find out about it,” my Dad asked, after I announced the reason for my impromptu weekend trip to New York City. “Twitter,” I responded with a satisfied grin. The next morning, I was barreling northward on I-95 aboard the Megabus from DC to NYC to attend the book launch party for The Best American Travel Writing 2009. 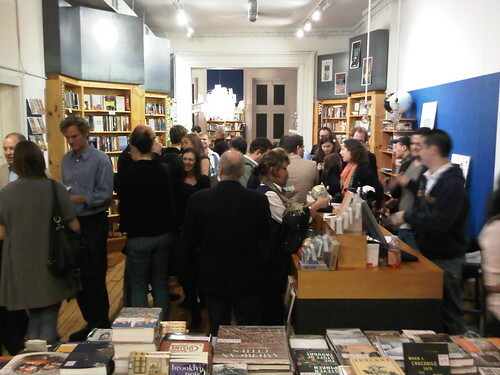 I've attended a sum total of zero book launch parties, so I had little idea of what to expect, though I was glad to know a few guys I'd been following on Twitter would be there. Idlewild Books is located near Union Square, which made it a convenient destination from my brother's East Village apartment. I arrived within minutes of the official 7 PM starting time to find a small, independent travel bookstore already filled with people chatting in small groups and browsing the shelves. My initial instinct lead me to pick up a few books on Nepal and the Himalaya, though my curiosity about the people in attendance soon took over. I walked to the nearby coffee table with wine, and poured myself a cup. And in the blink of an eye, I was chatting with sisters Emily and Bernadette, the former a student and writer from Drexel, and Joy who worked in public relations for Houghton Mifflin. I thought I recognized Craig from his Twitter photo when he entered the store, but I wasn't sure. Thankfully, his facial recognition is better than mine, and he came over to introduce himself. Craig is a freelance writer, and technically the first person I've met through Twitter. We were soon joined by Grant Lingel, author of the recently-released Imagine: A Vagabond Story. A few minutes later, Simon Winchester took the podium to introduce The Best American Travel Writing 2009. Simon is this year's guest editor for the series. I had noticed him earlier as he was the most distinguished looking man in the room. (Sidenote: Last year's guest editor was none other than Anthony Bourdain. I'm always one step behind the guy!). Simon took a few minutes to read aloud his thoughts on the importance of knowing world geography, and then introduced three of the authors included in the anthology. Andre Aciman, Matthew Power, and Elisabeth Eaves all read for 5-10 minutes from their contributions. My favorite was the piece by Matthew, which he wrote after joining an anarchist/punk rafting trip down the Mississippi River. The description of the make-shift raft was enough to hook me, let alone the character whose idea it was to put together such a modern day adventure. When the readings wrapped up, and the applause was rendered, I introduced myself to Mike Barish. I lucked out because his Twitter headshot, a photo of him eating a hamburger, does not make him the most easily identifiable person. He was dressed stylishly in a bow-tie, and sporting a fantastic beard which has since become a Twitter phenomena in its own right. Mike was incredibly friendly, and introduced me to several people including Eva Holland. While Mike writes for Gadling, Eva is a senior editor over at World Hum. And there I was, DIY blogger amidst two titans of travel in the online world. Later, I also met Jason Wilson, the series editor for The Best American Travel Writing 2009 and editor for Smart Set, an online magazine supported by Drexel University, before heading off to meet friends and continue the New York City night. Thanks for the shout-out! (Titan of travel? I'm blushing!) It was great meeting you, and a great event all around. Hi Eva, thanks for reading. It was well worth the ride up to NY. Simon will be at the NG HQ in DC tomorrow with Don George…I'm thinking of going there too. I study a whole lot of blogs recently and yours is a single from the best. I enjoy reading your posts – clear and well written. Your page goes straight to my bookmarks. I acquired some good inspirational thoughts after reading it.